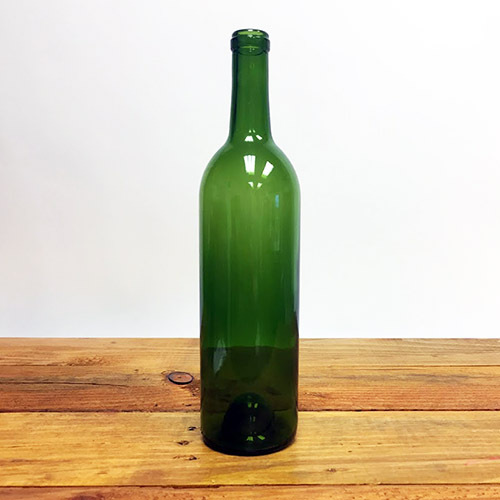 Our 750 milliliter Claret Wine Bottle in Champagne Green is a good choice for those home winemakers. Traditionally used for red wine made from grape varietals originating in Italy. Print and apply some custom Labels to turn your beverage into an impressive gift. Accepts 24 mm x 45 mm Corks, our UF25 single-piece natural corks are recommended for extended aging, while our Twin Disk Corks make an excellent and economic alternative for those looking to enjoy their wine within the decade. For temporary and resealing closures, see our Bar Top Corks. Please be sure to take a look at our Heat Shrink Sleeves and Bottle Waxes which come in a variety of colors. Every five gallons of wine will require 2 cases (24 individual) of 750 mL bottles. Quantity discounting available. Please allow 1-2 weeks for fulfillment of discounted orders. Subject to availability.